The World Surf League (WSL) Big Wave Tour (BWT) is greenlighting the Pe’ahi Challenge in Maui, Hawaii for an 8am start (local time) this Thursday, January 22, 2015. Watch the world’s best big wave surfers riding giant waves live at WorldSurfLeague.com as a projected 30-to-40-foot swell descends upon the region. Pe’ahi, also referred to as “Jaws”, breaks off the northern coastline of Maui with the ability to produce waves in excess of 60 feet. Although the break came to fame under the guise of tow-in, or jet-ski-assisted, surfing, a dedicated crew of paddle-in surfers have been pushing the boundaries of what is physically possible at the venue in recent years. 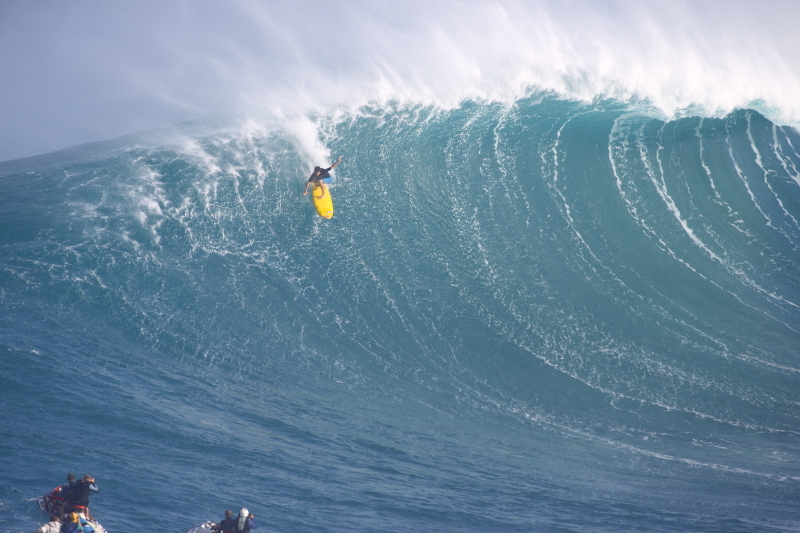 Thursday’s Pe’ahi Challenge will be the first paddle-in event ever held at the infamous venue. The 2014/2015 BWT season is divided into Southern Hemisphere and Northern Hemisphere components, each hosting three possible events. The Pe’ahi Challenge in Maui together with the Todos Santos Challenge in Mexico and the Punta Galea Challenge in the Basque Country (won by Nic Lamb) comprise the Northern Hemisphere half of the season. The Southern Hemisphere season ran from April 15 to August 31, 2014 with event options in Chile, Peru and South Africa. The Billabong Pico Alto was the only event to run, and on Thursday, July 3, 2014 Makua Rothman (HAW) claimed his maiden WSL BWT victory. With two events complete, the Hawaiian sits atop the BWT rankings heading into the Pe’ahi Challenge, the third BWT event of the season. A team of experts track swell systems all over the world waiting for those that will produce waves in the 30-foot-and-larger range necessary for a BWT event to run. Thursday is starting to look more promising, with a touch more ‘north’ in the swell, assuming the storm and secondary fetch behaves as forecast in the next couple days. While swell direction still isn’t ideal, with peak direction around 305 degrees, it does look like it will open up more with a directional spread of 290-320 degrees. That should help set up 30’ faces for most of the day on Thursday and improved consistency. The good thing about this swell direction is that for the waves that do get in we should see some really square barrels on the west bowl. Conditions look good to excellent at this point: light southerly wind for the first half of the day, possibly turning lightly onshore for the afternoon. Big Wave Commissioner Peter Mel will assess conditions on Thursday morning a final time before calling the Pe’ahi Challenge on for the day. The 24-man field for the Pe’ahi Challenge will be comprised of the WSL BWT Top 12, led by reigning world champion Grant ‘Twiggy’ Baker, as well as six WSL BWT wildcards and six local wildcards.